As reported by The Register, sites which do not use HTTPS will soon be actively labelled as “insecure” by the Chrome browser. HTTPS is the secure form of HTTP that makes the little green padlock appear in browsers. The Reg article suggests that initial changes will be deployed July 2018, and will be a little more subtle, but with Chrome having 55-60% market share, it really is time to switch your website to HTTPS. If you have both a “www” prefixed and bare version, as above, you’ll want to do both. 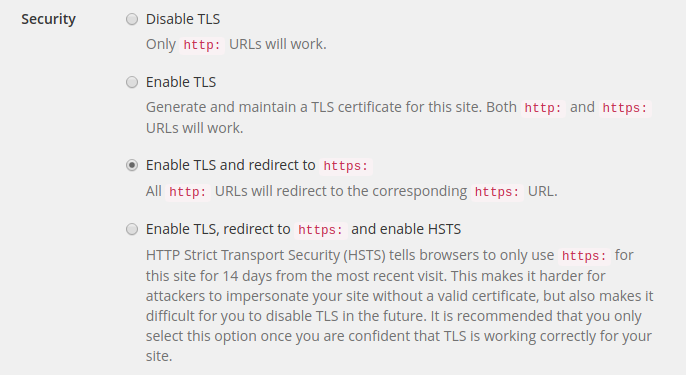 You almost certainly want the third option: this will enable HTTPS hosting, and ensure that users see the secure version of the site by default. (Once you’re happy that your HTTPS site is working exactly as you want it, you could consider switching to the fourth option). We’ve got plans to make this faster, but for the moment, you’ll need to wait a few minutes. We’ll go and obtain a certificate for your site, and once installed update your site so that it redirects to the HTTPS by default. If you haven’t got a working HTTPS site within 10 minutes, email us – we’re here to help. The instructions here will only work if the HTTP version of your site is hosted by Mythic Beasts. If you’re configuring a new site with Mythic Beasts, make sure that you can access your site via HTTP before enabling HTTPS. If you’re transferring a site to us that is already using HTTPS, please see our transfer in instructions for how to do this with an interruption to service. We’ve been deploying HTTPS as the default for customers of our managed services for some time. We’re going to be doing an audit of all managed sites to warn customers of this upcoming change, but in the meantime, if you’re a managed customer with an http site, just email us and we’ll sort it out.